We recently added several hundred alumni Facebook Pages to our directory and thought it'd be a good time to do another analysis of posts by college and university pages. We analyzed all the posts for the month of October (42,982 in all) for every page in our Facebook Page Directory (that's 1,007 pages). For detail-oriented folks, we've shared our methodology and an explanation of our engagement score. We wanted to highlight a few trends that we noticed while reviewing the top 500 posts from the month. In our previous analyses, we've shown again and again that a photo of your campus at sunset and a final score from a big win over a rival are almost guaranteed to get engagement. Don't worry, these still work, but we won't rehash them here unless it's a unique twist on one of these old standbys. October is playoff time for Major League Baseball. Several Kansas schools capitalized on the excitement of the Kansas City Royals' surprising playoff run to the World Series to rev up their fan base. Our favorite was probably Rockhurst University sharing a bet between its university president and the president of a fellow Jesuit university in San Francisco. KU turned its Rock Chalk chant into an easily shareable graphic supporting the Royals. Pittsburg State University announced the broadcast of a World Series game at its football stadium. And Eastern Mennonite University and Kutztown University touted alums on the field. Many colleges transitioned from the sunset photo to the aerial photo. A number of the 500 most engaging posts involved sharing a bird's-eye view of a school's campus. A few examples from Brown University, Hope College, Cornell Alumni Association, Smith College, and Kent State. Facebook Pages are often competing for eyeballs in the News Feed with Top 10 lists from Buzzfeed and the Huffington Post. Why not take a page from their playbooks and do your own list? 27 Things Only TCNJ Students Understand, Because It's Pronounced "You-Ing," Not "Ew-Ing"
This is a common theme. We saw it with Wichita State's run to the Final Four in 2013 and Union College's hockey title earlier this year. These are rare gold nuggets that can be mined for significant engagement. October was kind to a couple schools in Mississippi whose football teams were having historic starts. For you data-focused folks, here's a high-level look at the top 500 posts by content type. No surprise here... photos was the most popular content type. October seemed to have a larger share of Stat / Fact / Ranking / Infographic posts among the Top 500 than we've seen in previous analyses. We didn't see nearly any weather-related posts, but we're guessing that will pick up as winter arrives (I'm sure there have already been several for Buffalo-area schools this month after the recent snowstorm). We pulled every post available via Facebook's Graph API for every school in our directory of college and university Facebook Pages (1,007 pages were used in our analysis). We only analyzed posts made by the Facebook Page itself, not the fans of that page (42,892 posts). We made an attempt to remove any duplicate posts from this data to provide as accurate a picture as possible. We collected the count of likes, comments, and shares for each post. The data pulls were done during the first week of November 2014. We also pulled the fan data every week for each of the Facebook Pages in our directory, giving us a ballpark approximation of the fan count for a given page when a post was made. What was the range of engagement scores for the top 500 posts? The #1 most-engaging post had a score of 416. The #500 post had a score of 54. 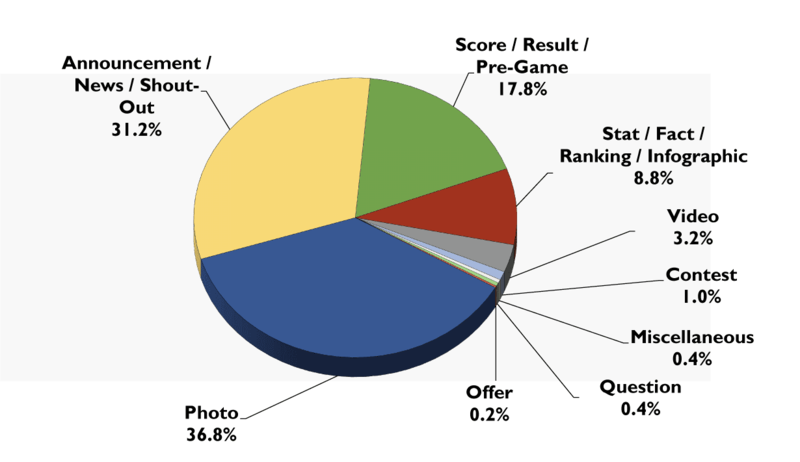 The average engagement score for all 42,982 posts analyzed for the month of October was 5.55. I hope that helps provide some context.